Gender reveal parties are becoming increasingly common in our social media age as expectant parents arrange elaborate celebrations to create photos and videos to share and enjoy for a lifetime. But some reveal ideas aren’t as smart as others — in fact, they can be disastrous. This 49-second video shows how one gender reveal party sparked the April 2017 Sawmill Fire in Arizona. Back on April 23, 2017, 37-year-old Border Patrol Agent Dennis Dickey and his wife brought an explosive target out into a yellow grassland in the Santa Rita Mountain foothills in order to learn the gender of their expected baby with a bang. After shooting the target that contained Tannerite, an explosive substance, there was an explosion and a cloud of blue smoke appeared… along with a sudden blaze in the surrounding grass. The entire incident was caught on camera by one of the party’s attendees, and the U.S. Forest Service released the video to the Arizona Daily Star this week through the Freedom of Information Act. Dickey admitted earlier this year to starting the fire, which went on to burn 47,000 acres and cost $8.2 million for 800 firefighters to put out. He pleaded guilty in a federal court back in September and agreed to pay $220,000 for what happened (he was originally ordered to pay the full $8,188,069). 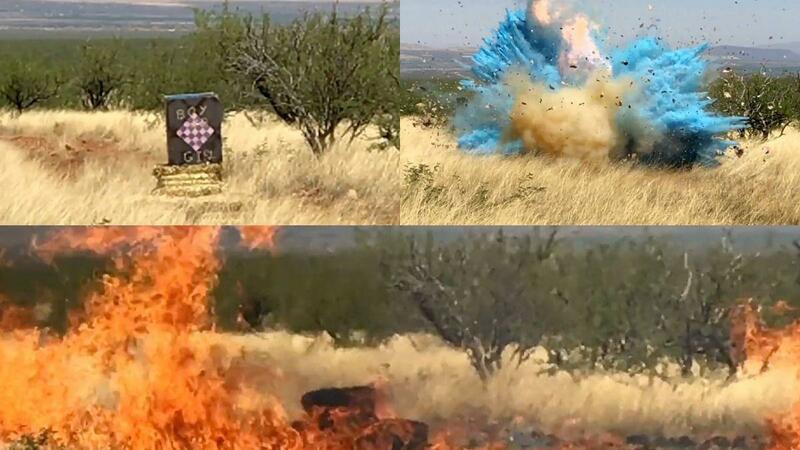 If you’re planning any kind of gender reveal party and photo shoot and you live in a wildfire area, you might want to stick to colored cakes or confetti-filled balloons.